In my post about The Lingering Havoc I originally said this incorrect statement about proficiency bonuses. Well it turns out you can’t just divide Challenge by four and round down, because proficiencies go up on the level immediately AFTER any which is a multiple of 4. By the rule above a Challenge 8 creature should have a +4 proficiency bonus, but actually it’s only +3. Creatures need to be Challenge 9 to get that +4 bonus. So there’s actually three ways to figure out a creature’s proficiency bonus. The first two are very simple and third is a bit of an easier formula than the one above. I’ve change The Lingering Havoc post to reflect this. If the creature is Challenge 1 – 20, simply look at any character class chart in the Basic D&D rules or the Player’s Handbook. Class level corresponds to a challenge rating when it comes to proficiency bonuses. If you like this method, know that creatures with a challenge rating of less than 1 always have a proficiency bonus of +2. Divide the creature’s challenge rating by 4. Add 1. If the result is a whole number that’s the creature’s proficiency bonus. If it’s a decimal round up to the nearest whole number and that is the creature’s proficiency bonus. The exception is Challenge 0 creatures, who always have a proficiency of +2. 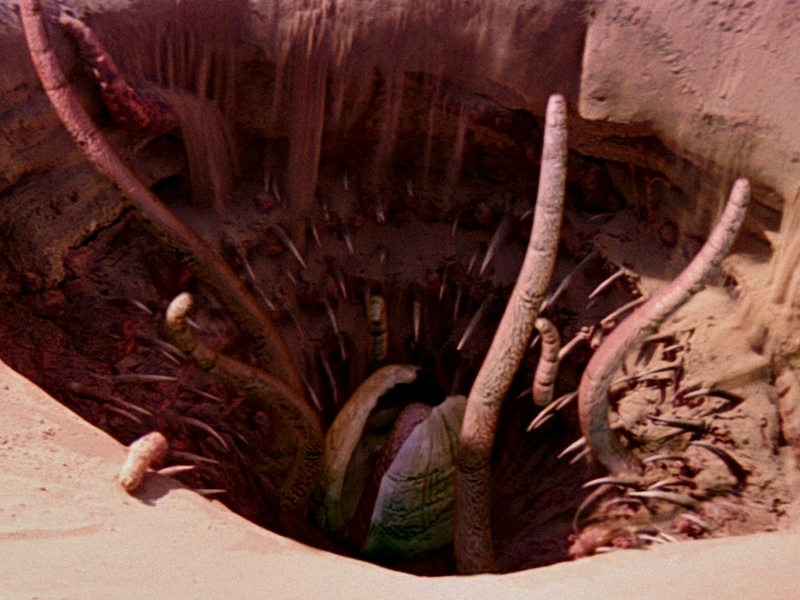 So if you missed my first post on the gaping maw, it’s essentially a sarlacc pit from Star Wars. These enormous aberrant creatures take root in the desert sand and use their tentacles to drag living prey into their huge open mouths. In Exploration Age these monsters didn’t retreat underground with the rest of the aberrants, because they’re firmly rooted in the ground. They procreate via spores cast out in the desert winds, so some of the gaping maws are young, but others are ancient and terrifying. So the gaping maw can’t move. That means when facing high-level characters alone, the gaping maw may not be much of a challenge, because creatures could simply fly out of the maw’s reach and pepper it with ranged attacks. Remember, this thing is inspired by the sarlacc a monster which appears in what happens to be one of the best action set pieces in cinema history. Check it out below! So the gaping maw is meant to be not just a monster, but a monster within a set piece battle. Or maybe you’re the creative type of DM who would put this beast into a tight space within an underground dungeon, or bury it with a sandstorm and let your adventurers suddenly find themselves on top of one. Whatever the case, when you’re reading this creature’s statistics think beyond adventurers simply taking it head on. One of the gimmicks of the gaping maw is that in order to shut off its powerful regeneration, it must be attacked from within. Of course, heading down the maw’s throat is a gamble in itself, as it’s stomach gases are meant to paralyze a swallowed creature as the gaping maw begins to slowly digest it. Check it out below and let me know what you think! Grappler. The gaping maw has advantage on attack rolls against a creature grappled by it. Regeneration. At the start of each of its turns, the gaping maw regains 5 hit points. If the gaping maw takes damage from a creature it has swallowed, this trait doesn’t function on the gaping maw’s next turn. This trait ceases to function while the gaping maw has 0 hit points. Tentacle Pull. The gaping maw can use its move to pull any number of creatures it is grappling adjacent to it. Multiattack. A gaping maw may make two tentacle attacks or one tentacle attack and one bite attack. Bite. Melee Weapon Attack: +8 to hit, reach 5ft., one creature. Hit: 20 (3d10 + 5) piercing damage. Tentacle. Melee Weapon Attack: +8 to hit, reach 15ft., one creature. Hit: 14 (2d8 + 5) bludgeoning damage and the target is grappled (escape DC 16). Until the grapple ends the target is restrained. The gaping maw has four tentacles and so it can only grapple four creatures in this way. Swallow. The gaping maw makes one bite attack against a Medium or smaller target it is grappling. If the attack hits, the target is swallowed and the grapple ends. The swallowed target is blinded and restrained, it has total cover against attacks and other effects outside the gaping maw. Swallowed creatures must succeed on a DC 15 Constitution saving throw or become paralyzed for 24 hours. At the end of this period if the creature is still swallowed by the gaping maw they save again or remained paralyzed for another 24 hours. If the creature does save but remains swallowed it is subject to another saving throw 24 hours after the successful one. A swallowed creature’s maximum hit points are reduced by 1 for every day it is swallowed. When it’s hit point maximum is reduced to 0 the creature is completely digested by the gaping maw and dies. Regeneration. At the start of each of its turns, the gaping maw regains 10 hit points. If the gaping maw takes damage from a creature it has swallowed, this trait doesn’t function on the gaping maw’s next turn. This trait ceases to function while the gaping maw has 0 hit points. Multiattack. A gaping maw may make three tentacle attacks or two tentacle attacks and one bite attack. Bite. Melee Weapon Attack: +10 to hit, reach 10ft., one creature. Hit: 25 (3d12 + 6) piercing damage. Tentacle. Melee Weapon Attack: +10 to hit, reach 20ft., one creature. Hit: 19 (3d8 + 6) bludgeoning damage and the target is grappled (escape DC 18). Until the grapple ends the target is restrained. The gaping maw has four tentacles and so it can only grapple four creatures in this way. Swallow. The gaping maw makes one bite attack against a Large or smaller target it is grappling. If the attack hits, the target is swallowed and the grapple ends. The swallowed target is blinded and restrained, it has total cover against attacks and other effects outside the gaping maw. Swallowed creatures must succeed on a DC 17 Constitution saving throw or become paralyzed for 24 hours. At the end of this period if the creature is still swallowed by the gaping maw they save again or remained paralyzed for another 24 hours. If the creature does save but remains swallowed it is subject to another saving throw 24 hours after the successful one. A swallowed creature’s maximum hit points are reduced by 1 for every day it is swallowed. When it’s hit point maximum is reduced to 0 the creature is completely digested by the gaping maw and dies. Magic Resistance. The gaping maw has advantage on saving throws against spells and other magical effects. Regeneration. At the start of each of its turns, the gaping maw regains 20 hit points. If the gaping maw takes damage from a creature it has swallowed, this trait doesn’t function on the gaping maw’s next turn. This trait ceases to function while the gaping maw has 0 hit points. Multiattack. A gaping maw may make four tentacle attacks or three tentacle attacks and one bite attack. Bite. Melee Weapon Attack: +14 to hit, reach 10ft., one creature. Hit: 30 (4d10 + 8) piercing damage. Tentacle. Melee Weapon Attack: +14 to hit, reach 30ft., one creature. Hit: 26 (4d8 + 8) bludgeoning damage and the target is grappled (escape DC 22). Until the grapple ends the target is restrained. The gaping maw has four tentacles and so it can only grapple four creatures in this way. Swallow. The gaping maw makes one bite attack against a Huge or smaller target it is grappling. If the attack hits, the target is swallowed and the grapple ends. The swallowed target is blinded and restrained, it has total cover against attacks and other effects outside the gaping maw. Swallowed creatures must succeed on a DC 21 Constitution saving throw or become paralyzed for 24 hours. At the end of this period if the creature is still swallowed by the gaping maw they save again or remained paralyzed for another 24 hours. If the creature does save but remains swallowed it is subject to another saving throw 24 hours after the successful one. A swallowed creature’s maximum hit points are reduced by 1 for every day it is swallowed. When it’s hit point maximum is reduced to 0 the creature is completely digested by the gaping maw and dies. How’d I do? Let me know in the comments below!